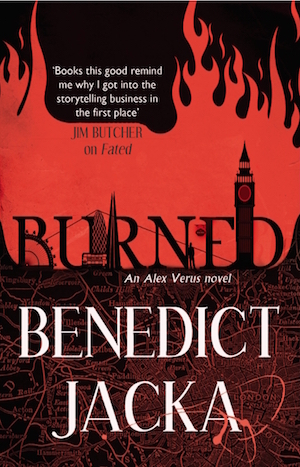 We did the US cover a couple of weeks back, and now here’s Alex Verus #7, Burned, in its UK clothes! As with the US cover, there’s a bit of a change of style for this one, though you’ll probably recognise the old elements too. The UK edition will be released on April 7th, 2016. 5 Responses to Burned UK cover reveal! Looks great, can’t wait to read it and listen on Audible. Cover is ugly-doesn’t look like the beautiful covers of the first 6 books. That dull red instead of the ‘parchment look’ is out of place with the rest of the books. Have to buy it to continue the series but I’m disapponted with changes that weren’t needed IMHO. Whoever designed this new cover looks like they were trying to copy the “Peter Grant” (aka “Rivers of London”) books’ style of cover, with the hand-drawn map background. The old covers looked better, were more original and were strongly associated with Alex Verus, not any other series. Changing the cover style halfway through a series is really, really annoying for people who like sets of things actually matching. I’ll get it anyway because I like the series so much, but I am distinctly unthrilled with the change.